One of the leading causes of lost work that I see in my office is neck pain, but we don’t hear much about it the print, radio, or TV media. There are many things that cause neck pain including poor posture and repetitive positioning – especially during long periods of time in front of a computer. It can also be the result of trauma, such as whiplash caused by a car accident. This issue is especially germane in states like Michigan that has no fault laws; and there can be secondary gain issues when attorneys and insurance companies become involved. Fortunately, most cases of neck pain resolve in a few days, but when it doesn’t then that’s a good time to see your doctor for a consultation. Your doctor will want to know if you are having any numbness, tingling, or weakness going down your arms or if you’re having difficulty walking. These are signs of either a herniated or ruptured disc. If these are accompanied by a loss of bowel or bladder function then your doctor will want to order an MRI or CT to rule out a cord compression of your spine. Luckily, these are rare occurrences in clinical practice. 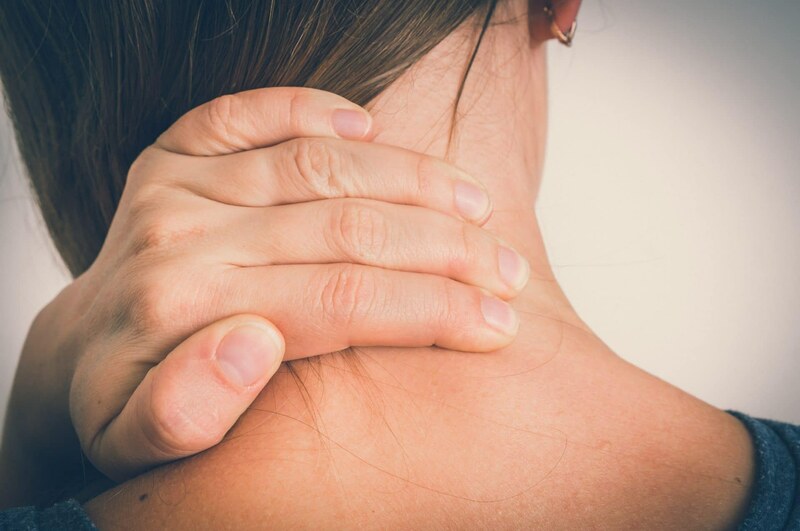 In most cases of neck pain an anti-inflammatory such as Motrin or Aleve will alleviate your pain. Moist heat or ice you will also help you get relief. You can avoid neck strain in your car by adjusting the head restraint so it sits as close to the top of your head as possible. When using a computer screen, make sure the center of the screen is slightly below eye level. If your workplace offers an adjustable desk, then this is your most ergonomic option. Sometimes sleeping on your back or stomach can help prevent neck pain. Also, I should note that regular stretching and taking breaks can minimize your neck pain whether it’s the computer or from whiplash.. Finally, I would also like to mention that a cervical collar which was once the standard of treatment for whiplash is rarely used these days because it can actually slow the recovery process. class="post-template-default single single-post postid-3747 single-format-standard samba_theme samba_left_nav samba_left_align samba_responsive wpb-js-composer js-comp-ver-5.7 vc_responsive"